Doesn't Fruit Have Too Much Sugar? But think about this… Do you actually know anyone who’s gotten fat from eating too much fruit? The answer is an obvious “no.” The myth that “fruit has too much sugar” and should be limited originated in the “Low Carb Diet” era and has been perpetuated by the Competitive Bodybuilding world. Some competition coaches choose to put their competitors on an excessively strict, no fruit diet in the last few weeks leading up to a show. This short term, high level athlete strategy has since been completely misinterpreted by the general public. Low fruit diets are only intended for high level athletes to use for a very short period of time; it’s quite well known among industry experts that such “low fruit” diets are unsustainable and not to be followed regularly, especially not by the general population. Furthermore, when it comes down to overall health, low fruit diets might even be dangerous. It doesn’t make sense to limit your intake of the superior nutrition you get from fruit. In spite of the long-running history of fruit as a main staple in the human diet, the condemning of fruit as having “too much sugar” has come to the forefront of the message in the diet and health industry. Indeed, too much sugar is bad for you, but it is nearly impossible to get too much sugar from fresh, plant-based sources such as fruit. Because not all sugar is created equal. Here’s the thing… your body processes natural sugars from fruit completely different than a refined, processed white sugar from baked goods and cookies. Since natural sugar from fruit is paired with water, fiber, and an enormous variety of vitamins, minerals, antioxidants, and electrolytes, it does not spike your blood sugar like traditional white sugar does. The problem with too much sugar comes from this spike in blood sugar, which over time can lead to a host of problems including diabetes and insulin insensitivity. Most fruit is actually lower on the glycemic index than starchy carbohydrates like bread and baked goods. This means your body has less of an insulin response to fruits, making them a completely healthy food to eat in abundance. Yes! Plant foods contain all of the proteins you need. According to the World Health Organization, the U.S. National Academies’ Institute of Medicine and the National Research Council protein consumption should be about 10% of total calories. Furthermore, the RDA (recommended daily allowance) of protein is 46 grams for women and 56 grams for men per day. Indeed, there is no need for high protein consumption – in fact, high animal protein consumption has been linked to higher rates of cancer. Every day our bodies are exposed to a wide variety of cancer-causing toxins and chemicals (carcinogens) from artificial food ingredients, household cleaners, detergents, pesticides, fake sweeteners, food dyes, and more. These carcinogens are metabolized by enzymes within the body and then begin to attack DNA. Most damaged DNA is repaired, but sometimes the toxic cell multiples before the damaged DNA is repaired, leading to a permanently damaged, cancerous cell. Think about it… if your body only needs 10-15% protein then what would it do with the extra protein consumed? When consumed, protein is broken down into amino acids, which are the building blocks of protein. These amino acids help to repair cell damage, including those of cancerous cells allowing them to grow and multiply into more cancerous cells. Now up to this point we’ve been talking about protein from animal products like meat, yogurt, cheese, eggs, etc. On the other hand, a diet rich in protein from plants does not elicit the same response within the body leading to the formation of cancerous cells and tumor growth. Hold up! Did we just say protein from PLANTS?!? You might be confused, but here’s the truth – THERE IS PROTEIN IN PLANTS! Most of us have fallen prey to the meat and dairy industries propaganda that made us believe otherwise. 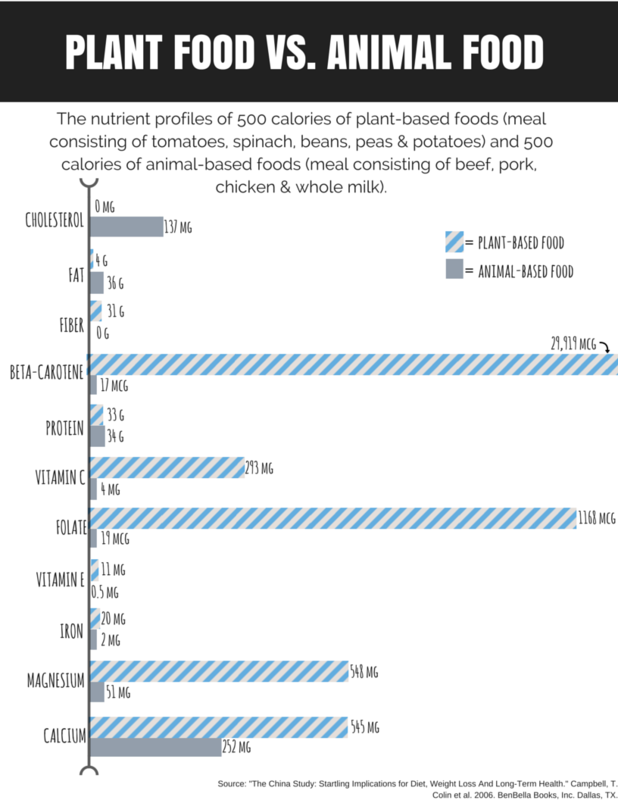 Just take a look at this infographic comparing the nutrients in plant-based foods vs. animal-based foods. Now, take a look at the protein amounts – they are virtually the same! Not only that, but plant-based foods contain way more nutrients than their animal-based counterparts. Look, it’s not about counting calories and eating whatever you want – everything from chemical filled 100 calorie packs to sugar-free puddings to artificial protein powders. It’s about quality over quantity – using real food nutrition to have endless energy, glowing skin, easy weight loss, and great health into your later years. I'm Nervous About Eating Too Many Carbs, What Do I Need To Know? Think you need to go low-carb to inhibit insulin release and lose weight? Think again. The spread of false message that fruit is bad for you and carbs are evil has been merely to make a profit off of trendy diets, cleanses, supplements and “health” foods. Think about it… How would someone make a profit off millions of people by telling them to only eat natural foods like fruit and veggies? They wouldn’t. So they don’t. What If I've Tried & Failed In The Past? Guess what? That just makes you human. 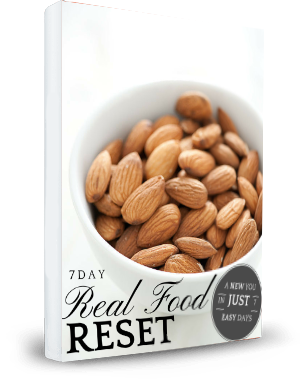 The Real Food Reset comes with a “What To Do If You Fail” worksheet to help you identify action steps you can take today to make your new habits last long term. If you’ve tried in the past and failed, chances are you did too much too soon. This guide breaks everything down for you in easy, step-by-step instructions so that you don’t overwhelm yourself or get discouraged. It teaches you how to turn thoughts into actions and increase your self control, confidence and willpower capacities so you can make it stick this time. A Plant Based Diet does not mean you need to be fully vegetarian or vegan. It simply means that you live by the motto: Whole, Real Foods First. It is an approach to eating that prioritizes quality over quantity and does away with the ineffective “Calories In/Calories Out” methods of diet & weight loss. Instead, with a Plant Based Diet, you’ll be eating an abundance of fruits, fresh vegetables, root vegetables, unprocessed whole grains and some healthy fats. This unlimited approach to health, longevity and Real Food consumption can help transform the way you see food forever. It can also improve health, fitness, lower body fat percentage, lower cholesterol levels, improve skin/hair/nail health, reduce fatigue, increase quality of life and much more. What Is Considered "Real Food," According To This Plan? Real Foods according to the Real Food Reset are high quality, nutrient dense, plant sourced foods. They should be grown in a whole, natural, organic, non-GMO and unprocessed way. Real Food groups include: Fruits, Fresh Vegetables, Root Vegetables, Unprocessed Whole Grains, and Healthy Fats (i.e. avocados, nuts, seeds, etc.). Why Should I Try This? What Are The Benefits? There are countless benefits to adopting a Real Food Plant Based Diet. Click here to discover 7 Reasons Why A Plant Based Diet Is Better For Everyone.